When you look at it, learning is a continuous experience. No I am not about to share any momentous discovery. Wish I can tell you about some great discovery or the key to riches or even longevity. Nah! I want to share some of my experiences in the last couple of months. It has given me some kind of strange sensing. How did it start really? First I was living on the edge of some anxiety. My publisher Gerry Huntman of IFWG could pass for the typical British, you know he could be very close mouthed about things. When I sent in the sequel to Numen Yeye, he didn’t let on about his assessment of the book. I took that in my stride because I assumed he was sympathetic about the fright I got when I had a few chapters left of the book. I had told him the book was about ready to be submitted and I had a chapter or two left. Then Numen went for a walk and simply disappeared from the computer! I almost died. Gerry gave me all types of suggestions, friends did, my IT friend stared for long hours at the darn computer Numen was not there. I cried for two nights wondering where I was going to start. Third morning, I went back to the computer and put it on, looking patiently at the files, my mind blank and came across one that the computer had named ‘temp’. Puzzled I clicked on it and there was…Numen!. I stared, and almost gingerly scrolled to the last page of ‘temp’. She had shed weight, not much but I whispered softly to her, asking her if she had missed home that much. I could continue and I could finish. I respectfully invited Numen to continue. When my husband walked into the sitting room he saw me in intense concentration, my head cocked to one side as I listened inwardly and told the story as I heard it. Numen had assumed an imperious tone and I had to catch up fast. You might think I am crazy as I tell you this, but for me, writing is always an emotional thing. I tend to feel the characters are personal because you see after introducing them to you, they tend to follow me around until they have finished their story. Some never really finish as they assume I am always there to listen. Numen just asked me if I have actually told you the specifics of what I have been talking about. I apologize. The sequel of Numen Yeye is now available to be purchased. 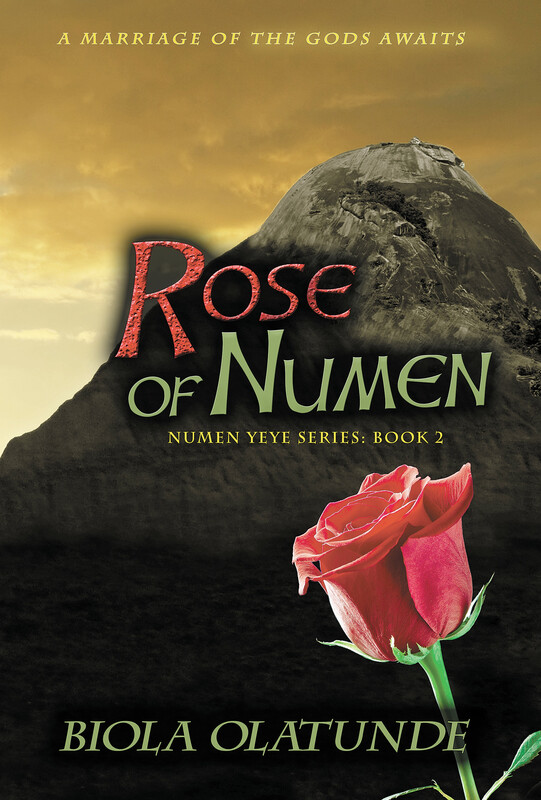 Rose of Numen the sequel to Numen Yeye is now in print and published. I will tell you some more very soon about why I wrote the trilogy. The third book in the series will come out sometime next year. I want to leave you with this question, is the concept of God meant for only ‘civilized’ parts of the world? Rituals, sacrifices and such ‘barbaric’ practices have been defined by civilized countries as being the prerogative of the Dark race of Africa, but from Historical records, is that really true? I am having a headache just thinking of it. I have a friend, he is British, a very good writer and he writes about the most brutal things. After reading his first book, I have been afraid to open another page of another book of his to read. He never gave mine a chance saying it was too exotic and yes..barbaric. There was no ritual nor anything to give you sleepless night. He just wrote me off the map. Kind of sad. Numen Yeye is African fantasy on spiritualism, everyday concept of our myths and confusion between our traditional religion and the Western imports. Rose of Numen continues where Numen yeye stopped. It is a trilogy that I am sure you will love to read. Take my loving dare and buy the two or anyone copy. I have been going round in circle in my brain. A couple of reason why I feel like my grandfather’s clock…you know the one that stopped working on the day he died. Remember that song? If you are from my side of the street, you might get where I am coming from. I did say I was going to use this blog to hold conversations. I never really asked you what you thought of that either. You know this monologue thing is not going to get me anywhere. Used to think if I just ignored the gnawing fear that rides my back sometimes I might just see past my fears. It is like giving birth to a baby and you assume there cannot possibly a baby just like yours. Those tiny perfect fingers could only be just that of your baby. When I wrote Numen Yeye, she started out under different names really. First it did not have a title just a collection of stories and cultures and then I met the lady one evening. I was actually writing a poem and suddenly in my mind I heard the first sigh and looked around wondering who was so sad. Then she whispered in the nicest way possible. “Can I tell you about me”? I stayed my hands on the keyboard and waited for the voice to come again and without warning she changed the subject. “You really have no need to know my real name just want to chat, isn’t that the word you say in these parts’? In those days, 1981, I was a scriptwriter more than a writer. So in one night, in long hand I wrote the manuscript. By the morning when my son came to ask me what was for breakfast, my fingers were stiff. My character(I did not know her name then) talked. Just soft whispers, she had a soft voice, and would occasionally pause if I indicated doubt and then I would sense her shrug, so I would ask her to continue or ask a few more questions, like clarifications. One time during the long night when she sensed I was tiring she would break her story and tell me bits about the village gossip. She seemed to know everybody. I remember asking her if she was an old lady and she gave a small laugh and said it would make no difference if she told me her age but she painted a picture of herself. “Just think of Woman as she ought to be and you would have an idea what you look like” she had answered in that voice that was beginning to be familiar. “What I look like”? I asked taken aback, looking round the empty silent room. “I am young, middle aged, and very old like from time” she said a small laugh in her voice. “Yes, I can sense you so please continue” I invited knowing she could just stop talking and I was having an experience that I wanted to feel to its last conclusion. She gave that soft laugh again and said she would be back the next morning or night as she was most times confused by our times and levels. Then my mind went blank and I looked up. My son was staring at me in bewilderment. “So what can we have for breakfast I am hungry” he looked at me strangely. I stared at the manuscripts, the long hand that had gone in different directions and tried to picture if I had been writing in my dream. I had talked to a character all night. I had more than 300 pages of longhand writing and sighed as I pictured another day typing them. I did not have a computer then and I knew she was coming back. I gave my sister money to buy something for breakfast. I started typing. I don’t know how I feel really. My new book is finally out in print and suddenly I have problem sleeping. I am so knotted up that I am beginning to have sensations I can’t really identify. I think about it and suddenly I am nervous, my hands go clammy and my heart races. I am presenting at a writers conference in a matter of days too. You know that feeling when you look at the new baby and you dream. You hold the book in your hand and you are hard put to put a name to the emotion that assails you. You mention casually to your friends that the book is finally out in print and you hold your breath waiting for the reaction. I had one yesterday. He is the editor of the local newspaper. A respected editor because unlike the usual pack of journalists who will want to find out what is it personally in a story, you can be very sure he is on the level. Very disciplined, untainted by the endemic corruption. I wanted to hear his own opinion and it was important for me. If he thinks your book is rubbish, he would courteously simply refuse to review it and would say very little. I waited and watched. He took the book, read the blurb at the back, as well as the first few pages while standing and suddenly gave a wide smile. He looked up and asked if he could read it first as he would like to own a personal copy of the book. I blinked. “What do you mean”? I asked him. “I think it is going to be a very interesting read” he answers and asked me what was the cover prize. I tentatively mentioned it and he nodded in agreement as he added, “only the very deep can understand what is in inside the book. I think it is going to be very interesting book indeed”. Now I have a sleepless night as I ask myself a thousand nervous questions. I have gone over the book again.. Lord I.. I caught myself suddenly praying. It is like waiting for your boyfriend to pop the question or something else, having a baby and suddenly being anxious that it was very important that this particular baby do well. You sense the significance of this particular baby and deep in your bones, you realize it is vitally important that this baby is acceptable. To serious readers. It is an indication of where you want to be now. What you want to say to the rest of the world I am a Yoruba woman who is learning to see my tribe as the rationale for this present incarnation. I have asked questions, like every growing young girl I have had dreams. My traditional religion had posed questions for me and I have searched for faith for years, tried to understand the risk of living without a faith and understood the fears of those who embraced other religions. I am not into the practice of traditional religion, but I had learnt gradually from my grandmother, my husband the value of having a root, a base to search for the meaning of my tradition and what it offers me. I have always wanted to know what it is and as I learned more, I understood and gradually a love, and understanding of the rationale for the basic faith has dawned. I may not necessarily engage in it but I can understand it and I can relate with the rationale behind it. It has made me want to portray myself “as is” I mean, what you see is what you get. It removes the strain of longing to be American, I never wished to be, but I love them and do not mind visiting them, learning about their cultures, but I could never be part of that culture. I would wish they have the charity to accept mine too. I feel the same way about all other cultures and accept the togetherness on our diversity. My book Numen Yeye has been a voyage of a sort for me personally. It has been a learning period too as I groped and searched for the meaning of my present incarnation and the rationale of my being. I first came across Numen Yeye on a warm night when my grandma started the story as the usual tales by moonlight ended and I still had urgent questions. I have listened to my grandmother since then as she continued with the story even after she got a seat with the ancestors. I hope you will like to read it, I would not mind to share it with you. I am proud of the depth we can reach if we only stretch forth our hand to each other in love.